You are here: Home / Columns / Column: Pop Culture / Happy Holidays! We should all be afraid of China – A-pop! All things Asian-y in popular culture! I think because we Americans are all a little self-centered, we don’t realize that if we got caught in a knife fight with China, we would lose so hard and bleed all over the ground as we die slowly, because for every one American with a knife, there are 4.3 Chinese with knives. Do the math, guys. Do the math. I love new car smell because I am an American. I like borrowing rental cars for four reasons: For the bluetooth stereo, for the backup camera, for the sun roof, and for the new car smell, which is a mixture of leather, plastic, sealants, glues, and other chemicals. Yum. Chinese people apparently think this smell is gross. So Ford is trying to invent new technologies that will get rid of the smell. One proposed idea is to ‘bake’ new cars in the sun with windows cracked and the engine and its heaters intermittently running so that the smell will dissipate. This idea is just a patent right now. Who knows if it will come to fruition before Ford becomes completely insolvent. In late November, Italian luxury brand Dolce & Gabbana (D&G) released three promotional videos on Chinese social media platform Weibo. 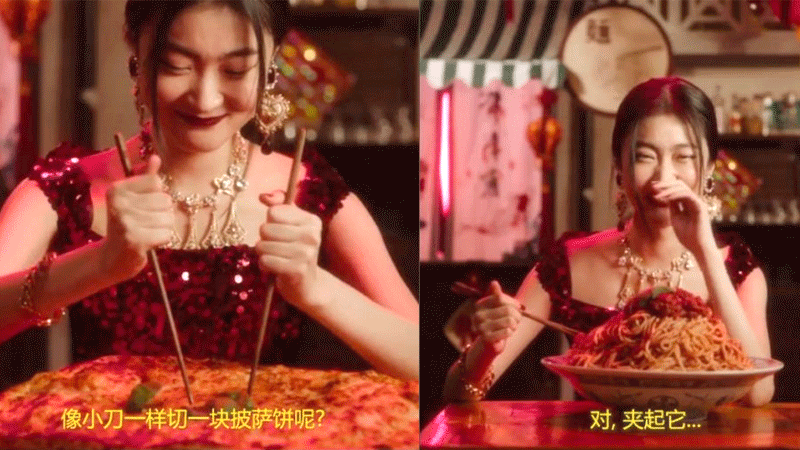 The videos featured a beautiful Asian woman in a super Oriental-looking red D&G dress over a super Oriental backdrop of paper lanterns from 60 years ago, trying to eat Italian fare like pizza, spaghetti, and a gigantic cannoli with a pair of chopsticks. She has a hard time with it because she’s dumb and has apparently never used chopsticks before in her life. The narrator basically mocks and mansplains to her, telling her stuff like to try not to use chopsticks like they are knives. These crappy ads were pulled within 24 hours, but by then, the damage was already done. A bunch of Chinese actors and models started shunning D&G. The internet went crazy. Angry Chinese people went to the D&G flagship store in Milan (sans knives, I think) and started returning stuff en masse. Online retailers had to pull D&G goods because the refund volume was bananas. Many hashtags were created. Boy band star Wang Junkai was like, UH BYE, and terminated his lucrative deal with D&G on the spot because they need him and he doesn’t need them! D&G ended up canceling their Nov. 21 fashion show, probably because they were afraid of getting shanked. London-based Brand Finance consultancy estimated that this one oopsie could cost D&G 20 percent of the brand’s $937 million value. Oh damn! This summer’s breakout hit, “Crazy Rich Asians,” totally flopped in China, despite being the first Hollywood film in decades to feature a predominantly Asian cast in a contemporary setting. It took $237.9 million worldwide, but when it premiered in China early December, it pulled in only $1.2 million its opening weekend. There are a few reasons floating about for this dismal performance — one of which is the very long delay between its release in the States versus its release in China. For many financial and political reasons, Chinese authorities may delay the release of foreign films in China for months. Also, as Vulture reported, romantic comedies generally don’t travel well overseas in a market that is already saturated with its own in-language romantic comedies, all of which are already populated by beautiful Asian faces. That is, Chinese movie-goers were not at all charmed by the ground-breaking (in America) all-Asian cast. The number one grossing movie in the world the second weekend in December is a movie that is opening in the United States this weekend. WB/DC’s “Aquaman” opened in China early and just demolished, grossing $93.6 million. It only opened in one market: China. But that was all it took. In contrast, “Ralph Breaks the Internet” opened earlier this month at the number one spot in the United States, grossing $16.1 million. Guys, do we even matter anymore? He recently said that he’s bringing a Chinese food chain restaurant to the Midwest that is also a tiki bar (okay?) because middle America has “horsesh**” Chinese food restaurants. A lot of the restaurants he trashed in one fell swoop are Chinese American-owned, restaurants that are probably generations old, that had to adapt ingredients and flavors to be profitable in a country that likes to put American cheese on top of tuna mixed with mayo. But whatever. Zimmern is a white guy with passion and ideas. You can’t stand in the way of a white guy with unearned confidence and lots of ideas! We need to just get out of the way and just let him ascend. Sandra Oh is hosting the Golden Globes with Andy Samberg. Watch it on live TV (haha) on Jan. 6, 2019. “Shang-Chi” movie getting fast-tracked by Marvel. This could be the first superhero movie that features an Asian protagonist (unless DC magically beats Marvel to the punch with like, an Asian Hulk movie. COME ON, DC, DO IT). Also, can all of the Asians just make a pact right now? Can we all promise each other to never refer to this movie as the “Asian Black Panther”? It’s not a good look, guys. Guys, I’m totally obsessed with scoping out representations of hot, dim-witted Asian men with hearts of gold on television. Previous baes include Jason Mendoza (played by Manny Jacinto, “The Good Place”) and Josh Chan (Vincent Rodriguez III, “Crazy Ex-Girlfriend”). Well, I am happy to announce that there’s another kinda-slow Asian hottie for us to feast our eyes on. His name is Miggy Park. He’s on ABC’s new show “Single Parents” and he is played by Jake Choi. Clap clap clap! More dumb-beautiful Asian men on TV please!